Hooray! The sunny weather has found us again, and it’s time to get active. The only downside is that warmer temps cause fleas and ticks to also become active – and oh boy – are they active this year. Wisconsin was recently listed as the 4th worst state for Lyme Disease in the country! Because of this, effective flea and tick control for your pets is vitally important this year. And luckily, we have several methods of prevention and treatment to keep your dog or cat healthy throughout the season. Wisconsin has two kinds of ticks: deer ticks and wood ticks. 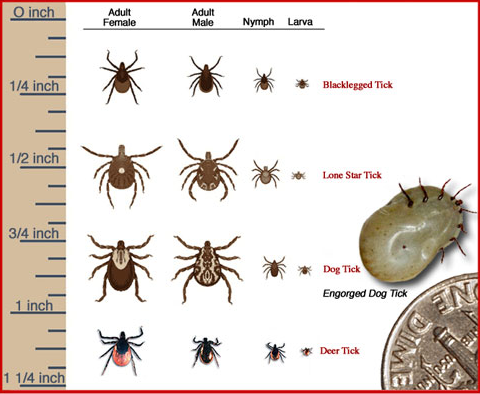 While all ticks can carry illness and diseases that may affect both animals and humans, it is the smaller deer tick (no larger than the head of a pin!) that carries Lyme disease. Ticks crawl up on the tall grass outside and wait until a “host” passes by, then jump aboard to feed. It’s important to remove them as soon as possible, but a deer tick must be attached to its host at least 24-hours before Lyme disease can be transmitted. Lyme Disease is most commonly found in dogs, but how do you know if your dog is at risk? Thoroughly check your dog for ticks every time they have been outside in the grass. Finding the ticks right away is key, as it takes 48 hours of feeding for the disease to spread. Deer ticks can be very difficult to spot, and even after they are removed, there are often "mouth parts" from the tick left behind. Those also must be completely removed for your dog to be in the clear, but it can be difficult to be sure to the untrained eye. To be on the safe side, bring your dog in right away to get the mouth parts cleaned out and be tested for Lyme. It is very economical and highly effective to treat dogs early in this stage of infection. If your dog has any of these symptoms, make an appointment right away. 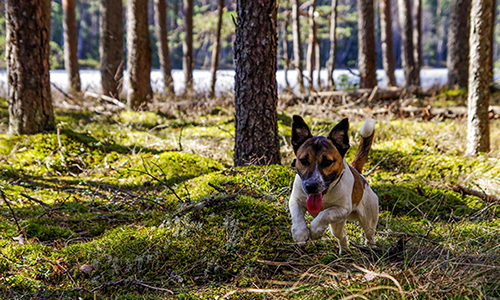 There are blood tests to confirm the presence of Lyme disease, but we’ll also do a thorough exam and talk to you about your dog’s history of exposure. After being outside in the grass or woods, do a “tick check” on yourself and your pet before you go back inside. Treatment of Lyme disease in dogs is usually done with tetracycline or a penicillin type antibiotic for at least 14 days and often longer. Most dogs respond quickly, though in a few cases, dogs will continue to have chronic symptoms and may develop arthritis. Sometimes the blood test may show a positive result when your dog does not have Lyme disease. In this case, your dog has probably been exposed to the bacteria, but doesn’t actually have the disease. Always remember – the best treatment for Lyme disease is prevention. Fleas are notoriously difficult to treat. Did you know that only 5% of fleas actually live on your pet? The other 95% live as eggs, larvae, or pupae in the environment—the woods, your yard, your carpeting and furniture…even your car if your pet travels with you on a regular basis! Once you kill all of the fleas infesting your pet, you must keep continuously using the topical/oral products to deal with additional hatching fleas in the environment just waiting to jump back on for a ride and a meal. Why not just avoid these issues altogether? A yearly vaccination for dogs that have not been infected, and a year-round monthly preventative program will ensure that deer ticks are merely annoying outdoor pests, and nothing more. But even with a vaccine, it’s important to use a monthly topical or oral flea/tick repellent that can kill the mites throughout their entire life cycle. We have several trusted, proven treatments for both dogs and cats that we highly recommend. If your pet has an embedded/suspected tick or is showing symptoms of flea/tick exposure, don’t hesitate – call us for an appointment at 262-728-8622! As your local veterinary clinic, we can test your four-legged loved one for Lyme Disease and other infections and prescribe antibiotics to keep them safe and healthy.